Ed notes: In this post, I have done a major update of the recipe and rewritten the cooking notes since I first published it two years ago. I have also written a series of posts with more photos, the "science" behind it and how to cook this for a large party. Check out the series of posts through this link. I have also worked out a smaller portion recipe. 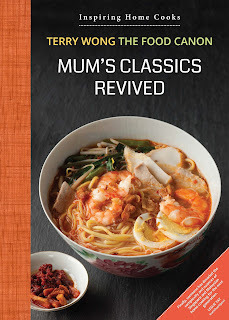 My mum's Hokkien Prawn Mee was one of her 'signature' dishes. Annually, on Teachers' Day, she would cook for all the children teachers and helpers in my church's Super Powerkids Ministry. That tradition has of course ceased the year my mum passed away. When news got round that she is cooking this, family members and friends will gather in anticipation. And this is the dish she cooked for a a group of friends before she fell seriously ill. It was her last celebration. I still remembered how I visited my friend's place to enjoy it. When we meet, we still reminisce about this. For some reason, there seems to be a mental block when it came to my Mum's hae mee. "It is too complicated" is an oft heard refrain as some of us discussed the possibility of recreating her specialty. I have some good news. It is really not very difficult to cook this. There is a simplicity in the way my mum made it and if you follow that, you should be pleased with the outcome each time. Peel and separate the heads and shells of all the prawns. Trim off the sharp pointers at the top of the heads. Heat up 3 Tbps of oil in a wok and roast the dried shrimps for 10 minutes. Then add the heads/shells and roast till they turn golden orange. Add 4 litres of water and pulverise using a stick blender or standing blender. You should see some orange or red coloured foam at the surface of the stock. Cover and simmer the stock for half an hour. Then let it steep overnight for maximum flavour extraction. You can also do this earlier in the day and let the flavours develop by dinner time. Lard is of course optional but the flavour and mouth feel of pork fat is fantastic in the broth. Cut the pork fat into 1 cm (0.4 in) cubes. In a pan, slowly heat up the cubed fat. The oil will slowly flow out and fry the rest of the fat. Keep the fire low so as not to burn the lardon. It will take about an hour to do it right. When the cubs have shrunk to a quarter of its original size, increase the fire to get the lardon nicely browned. The lardon can be offered as a garnish but the oil is what you want. Lard can be prepared beforehand and stored in the fridge for weeks. Leave about half a bowl of the lard in the wok to make the sambal chilli. Blend the soaked dried chilli into a paste. Then, over low fire, add paste and simmer for 15 minutes. You can also use ready-made or store bought chilli paste. Keep the broth on a simmer. It is important to taste it as you develop the flavours to learn how each ingredients move the broth closer to the outcome you want. While I give the quantities of ingredients in the recipe, the sweetness and saltiness which you prefer may be different from mine. Learn to train your palate to balance the flavours. If you have tasted some good Hae Mee or tasted mine, those palate memories can guide you. Add the belachan and a bowl of the sambal chili (with lard oil) into the broth. Add some water along the way. You can also add an additional half a bowl of lard to improve the stock. You need to end up with about 8 liters of broth for 30 bowls. Don’t rush through this stage. 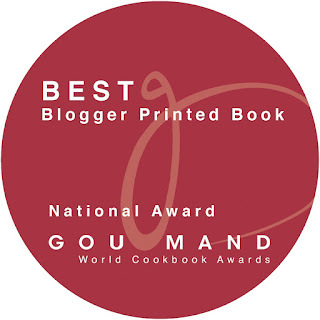 This is where a cook can improve his skills, palate and learn the steps in improving a broth. Sometimes, I ladle out some broth into a bowl and flavour it to find a right estimate of what is needed in the pot. Of course, if you are using the same ingredients again and with experience, you will get more confident. Set aside 60 pieces of prawn meat for the topping. Keep the remainder for other uses. Devein the prawn meat for the topping using a toothpick or the sharp edge of a knife. It is easier to devein before you blanch them. Blanch the prawns in the boiling stock using a strainer. Do this in small batches as the prawns need to cook quickly or the meat will fall apart on the sides. If you are doing this the day before serving, refrigerate the prawns. They keep well after they are cooked. Simmer the pork loin meat in the stock for 30 to 40 minutes depending on how large the chunks are. Don't overcook it so that it is not dry. Slice the boiled prawns into halves. Slice the pork loin and fish cakes. Fried shallots are indispensable. Make your own if you can. If you use commercial ones, get those which are fresh and crispy. Soften the bee hoon in water for about 30 minutes. When it is time to serve, assemble a serving of the bean sprouts, mee, bee hoon and kangkong in a bowl. Blanch the contents of the bowl in rolling boiling water for about half a minute. This will also remove the “kee” (alkaline) smell of the yellow noodles. Put back into the bowl. Garnish with slices of prawns, pork and fish cake. Pour in the boiling broth and drain. Do it twice. Garnish with fried shallots and serve immediately with plates of sambal chilli and lardon on the side. It may take a few tries to master this dish but the responses from your family or guests will encourage you. It may seem like a lot of work but it will become intuitive as you become more experienced. As with all party dishes, effort and work is needed but your guest will remember this meal for a long time. As someone said, a good recipe is about doing many small steps right. It is true for this dish. The stock is primarily a prawn or shrimp stock with some secondary flavours from meat stock, i.e. chicken or pork. Once you grasp this, you will know how to vary the ingredients as you will be using different type of prawns, depending on what you can get from the market in your area. If you have very small shrimps, they can be used whole without peeling. Remember to roast it first before pulverising. I added some Hakka Deep Fried Pork just for the photo here. You can add blanched thinly sliced pieces of pork, which is traditionally done. Try this out. You may not get it perfectly right the first time. But after a few tries, like me, you will be wondering why this is not a common hawker dish here. It is also cheap to make (in M'sia , the hawkers use really small prawns). Just about everyone I have met loves this. Some are gila over it. We shall now wait for Teachers Day and I am looking forward to hearing joyful sounds of children teachers again. This tradition needs to live on, in appreciation for those who labor over our children...and in remembrance of the ever generous Auntie Ruby. If you want to taste this, you can consider serving in my church's Super Powerkids ministry :). Preparing the Prawn Stock: the orangey foam is a sign that a good PPM is on the way. I made this batch for 160 pax. The PPM broth is done. Most welcome. This is what this blog is for. That deep fried pork adds a bit more decadence to a wonderful dish. BTW, i have been searching high and low for a stick blender! Where can I buy it? Oh, I'm living in Malaysia. Hopefully, I'm able to get Braun Stick Blender here :) I really hate cleaning the blender, this stick blender would be so much easier to clean! Thanks for your recommendation! May i know the recipe for the sambal of the prawn noodle dry version? Also the recipe of the flat yellow noodle of the prawn noodle dry version.I personally prefer the dry version because it tastes better than the soup version. Can I pour the shells and heads in a blender and blend it? Tks! I just returned from living in Singapore for the last 2 years and I am missing the food very much. I have tried two of your recipes now and they are amazing. Thank you. Can't wait to try your recipe! Re the chili paste, is the oil 10 gm or the belachan 10 gm? your hokkien mee looks perfect for me especially the shrimp . the only thing is it wasnt the sliced shrimp. lots of ppl like to serve the bigger shrimp for hokkien mee.. but only perfect small size of sliced shrimp will make the hokkien mee taste PERFECT!!! Thanx for your recipe. I will try and get back to you .. as i have been looking for the Old Time taste hokkien mee for years. You are definitely right. If you have a good bowl of Hokkien Mee, gigantic prawns will affect the balance of the dish. The proportion of Kangkong, noodles, pork, chilli, slices of small prawns etc is just right for every mouthful. I am back here to thank you for your sharing. it taste almost perfect as I didnt follow 100% of your recipes. thank you thank you again. I will check into your other recipes . Wife was craving Prawn Noodle for weeks, I found your blog originally from your HCR post and decided to make this recipie - she says as good as the best food stalls back in Sitiawan. Will definitely be making many times! Thank you so much for sharing all your family recipies - so many people guard theirs with iron fist. Double - Glad you like the recipe. One reason why Asian cuisine is evolving slower than Western is because of the ways Asians in general guard their recipes. My Mum was not like that at all and this blog reflect her values. It's wonderfully refreshing - I love all these foods having been introduced to them while staying with my wife's family in Malaysia, so difficult if not impossible to find now that I'm in Washington, DC. Your Mum's recipes are a wonderful reminder of what I consider my second home. Just cooked your Ipoh Kai See Hor Fun yesterday - was every bit as good as the famous places in Ipoh. One trick I've discovered for getting the noodles as silky - add about a tablespoon of Baking Powder to the water when you soak the noodles, then rinse a couple of times before blanching. Hi Double - Interesting tip. Will try that for the hor fun here in Toronto ( I am here for a few months). 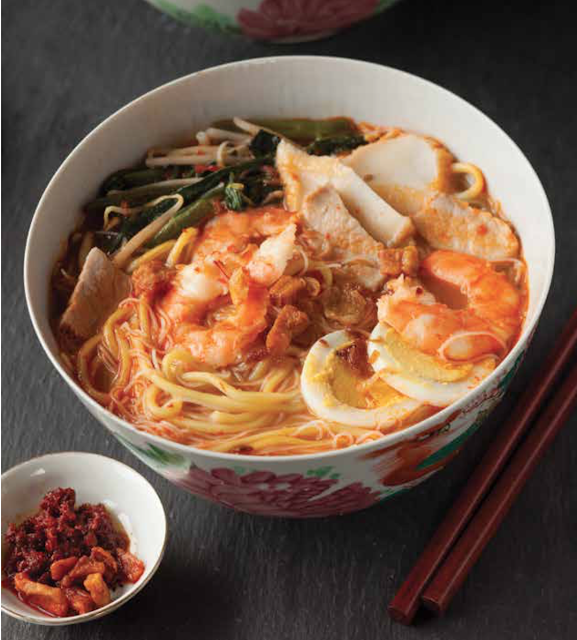 Thank you for your recipe and I would like to share that I have purchase the Hokkien Mee paste and Laksa paste from an online store ( http://www.mementohovel.com ) specialised on selling Penang Delicacies. The paste is enable me to cook Penang Hokkien Mee as easy as 1-2-3 and the taste is similar with the stall I ate before in Penang .. I was recommeded cause I no need to step into Penang and I'm able to taste the their delicacies. My prawn stock is still very gritty despite blitzing it with a Braun stick then again in a Thermomix. If I were to strain it, would it affect the taste greatly? Thanks! The Prawn Mee turned out delicious, thank you for sharing your mum's recipe! What type of prawns do you use? I bought Ang Hae today but the broth has a lesser reddish hue compared to the ordinary local glass prawns. Good to have some ikan bills for the taste. But can definitely add pork ribs and serve alongside. Use your recipe cook few times for my family and colleagues. Everyone commented this is better than stall outside. Thanks food canon and aunty Ruby for sharing the recipe. Thank you for your feedback, Yin Yin. I saw in the last part that 'blachan' is added but did not read it as part of the ingredients. Must we toast the blachan and about how much to add? Also, we have 2 batches of stock as per the recipe. What happens to the pulverised prawn head stock? Do we mix with second stock with the chicken buillion and all? belachan is optional. The pulverised prawn head stock need to be strained and the stock added to the other. Hi, is there any variation of the recipe that serves less? Like for 4-8ppl?